As with all of Johnson's segments, regarding the contraception mandate (He mentioned it with Gretchen Carlson but Komen was the main focus of the segment), his fellow talker was a male which is appropriate given that that those who represent the teaching authority of the Catholic Church are all male). The title of the segment, "Prescription for Truth" was ironic given that truth, once again, was a casualty. After reporting the back story, Dave Briggs gave the pulpit to Catholic knight in shining armor, Peter Johnson Jr. Briggs asked the uterus free Johnson if free contraception is a right. Johnson wasted no time in bashing Obama for making a "broad partisan statement" to his base regarding the proposed policy. He mentioned Planned Parenthood as part of the group that Obama consulted with "to infringe on religious liberty" and protect the health rights of women. (Silly women want rights?) The Fox chyron told the audience what it needed to know: "Clashing With Catholics, President Offers 'Accomodation' to Mandate." What Johnson didn't mention is that both Planned Parenthood and Sister Carol Keehan, head of the Catholic Hospital Association, were in agreement with the "accomodation." Johnson also ignored medical findings that say that if contraception keeps women health and lowers costs for contraception. Despite the real fact that there have been no legal findings on the mandate, Johnson cited Fox fact that Obama has "backed off from an unconstitutional action." Johnson continues to ignore the fact that "Courts in two of the 20 states that offer exemptions to contraceptive coverage for insurers and employers, New York and California, have found conscience clauses like the HHS interim rule affecting only houses of worship to be constitutional." After questioning the effect of the recent decision on insurance carriers, he mentioned that those who are exempted from the rule won't be able to get "abortion producing drugs..." More agitprop with this chyron: "Smoke and Mirrors? President: Religious Orgs Exempt From Mandate." Johnson repeated his lie when he complained that the president is saying that insurance companies have to provide "abortion inducing drugs" for free. The Cavuto marked chyron reflected Fox's and the bishop's sentiment that women have no right to birth control: "The Right to Contraception? President Argues That It Must Be Free for All Women." Johnson said "it's a Ponzi game" and a "bait and switch." He added that the bishops should be commended for defending Catholicism and the Constitution. The HHS mandate DOES NOT COVER ABORTION INDUCING DRUGS. RU 486 is not part of the package and emergency contraception, outside the purview of the Vatican IS NOT ABORTION INDUCING as it merely prevents a pregnancy. No pregnancy - no abortion. It also doesn't affect the fetus if a woman is pregnant. And I can't believe that it's 2012 and we're talking about a woman's right to birth control. The last time I heard this argument was around 1961 when Catholic priests used their pulpits to condemn Planned Parenthood and women who used the sinful birth control pill. ("Every Sperm is Sacred!") I was appalled then and I continue to be appalled at how this church uses its power and wealth to try to impose its misogynistic views on all women. And unlike the old days, it has a national news network from which to spread its, IMHO, archaic, misogynistic views. 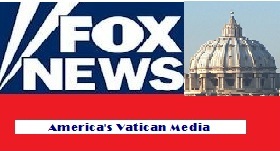 Fox News "fair & balanced" thanks be to Roger Ailes, Fox's "version of God." Is anti-contraceptive the same as anti-woman? I guess the Republican party will find out if they’ve narrowed their base even further with their effort to identify with only the most extreme Christian groups plays out.